As part of the construction of the New Champlain Bridge Corridor Project, Signature on the Saint Lawrence wishes to inform road users of a major disruption on Hwy‑132 East/West and Marie‑Victorin Blvd West from Friday, April 13 at 10 p.m. to Monday, April 16 at 5 a.m. It will allow the installation of the box girders for the central corridor of the new Champlain Bridge over these roads. 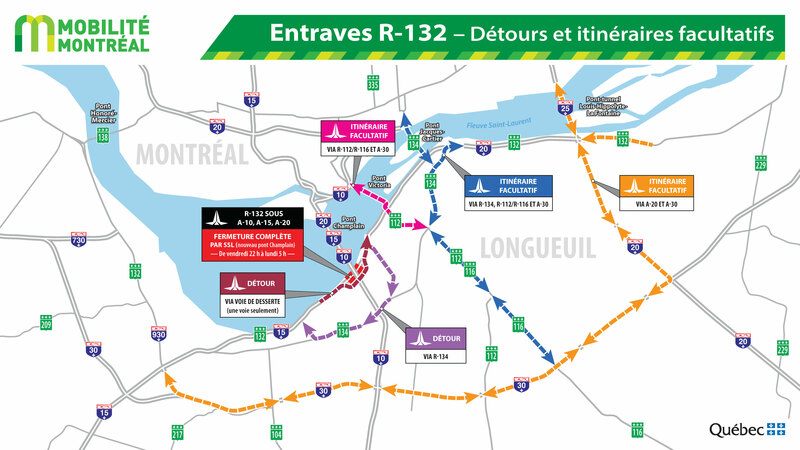 Closure of Hwy‑132 East between Exit 53 – Champlain Bridge and the entrance from the Champlain Bridge. Closure of Hwy‑132 West between Exit 76 – Simard Blvd and the access ramp from the Champlain Bridge. Closure of Exit 6 – Hwy‑15 South / Hwy‑20 East / La Prairie / Varenne from Hwy‑10 toward Hwy‑132 West. Closure of Marie‑Victorin Blvd West under Hwy‑15. 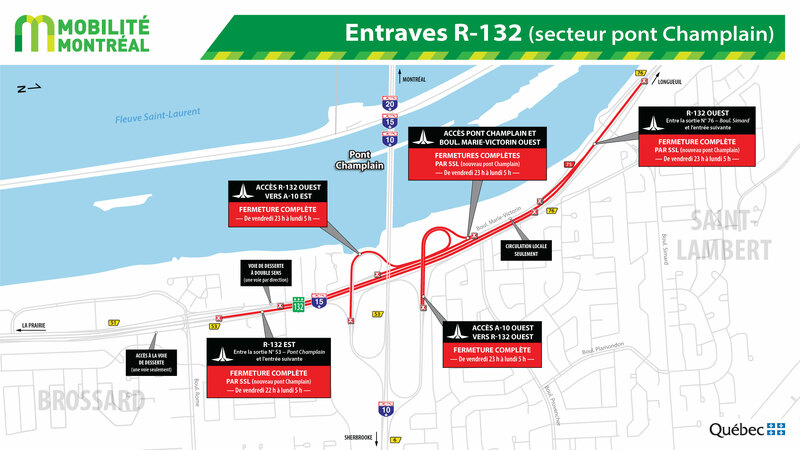 Closure of the Marie‑Victorin Blvd West access to Hwy‑15 South / Champlain Bridge. Marie‑Victorin Blvd West will be open in both directions near the business on the Simard Blvd side and near homes on the De Rome Blvd side. Drivers are encouraged to check our website or follow us on Twitter@nouv_champlain for the latest information on traffic disruptions. You can learn about the main disruptions on the Waze community-based traffic and navigation app as well. We also strongly urge drivers to check the MTQ website www.quebec511.info before setting out or to follow the MTQ on Twitter @Qc511_Mtl for information on all the disruptions in the Greater Montreal road network. Public transit users can visit the STM website or RTL website to see the impact on their route and bus stops.